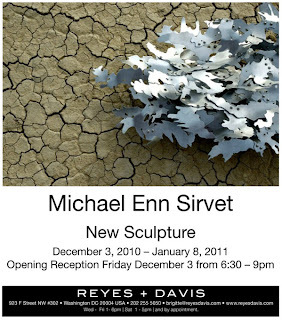 The solo exhibit of Michael Enn Sirvet’s sculpture at Reyes + Davis Gallery (923 F St NW) has been extended to January 15, 2011. Thus, those who haven’t seen it still have a week to see this extraordinary work. Sirvet’s trajectory over the past few years has been exactly that: extraordinary. I first saw and reviewed his work at the Glenview Mansion in Rockville in June 2004, impressed by his combination of organic shapes, exquisite craft and mathematical brilliance. Since then, the core of his practice remains the same, but the challenges he sets himself, and the risks he’s willing to take to achieve them, have grown and changed. This is perhaps the best thing we can say about an artist—that he/she is working in a trajectory, new things building on what came before, new creativity coming out of a thorough investigation of each new idea, and going forward with that. Sirvet is a structural engineer by training and employment for a decade before he decided to go full time as an artist in 2008. It is evident to even the casual observer that this background both informs and strengthens his art work. Nothing is haphazard. Everything is carefully planned, organized and impeccably created. Yet, there’s a wild side to this artist, one that relates to the woods and the backcountry. And that’s here too. Leaf forms made of aluminum, which also look like frozen fire. Hanging pieces that recall beehives in the perfection of their structure, but are also industrial in their materials. Wood, aluminum, brass, bent to remake the hidden perfection of nature evident in works whose aesthetic is thoroughly grounded in it.